This Five Cycling Senses is an aesthetic series so I won't dwell too long on the obvious 'smell' factor regarding urban cycling - exhaust from motor vehicles. 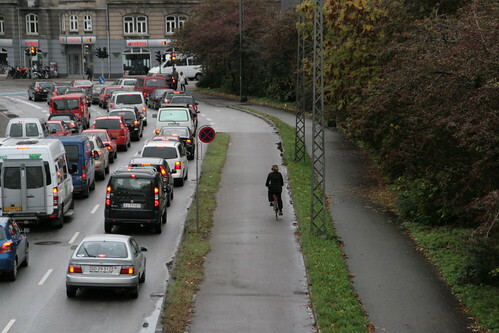 I'll just hurry up and link to this post over at Copenhagenize.com about how studies have shown that the level of polluting particles is higher INSIDE cars than next to them on a bike. So while we have to live with exhaust, we can pity the motorists. And this post highlights how traffic [meaning pollution and noise] kills ten times more people than traffic accidents, so cycling is a fantastic, safe way to stay healthy. 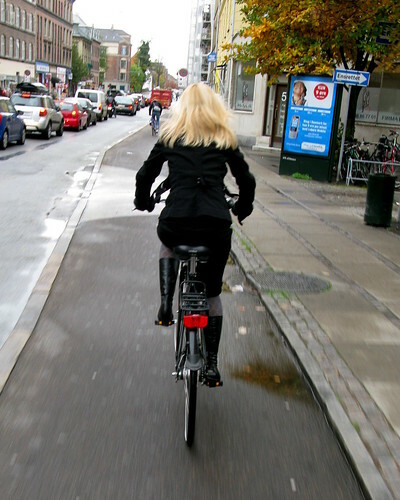 And as with the cyclist on the lovely, wide bike lane above, we can just zip right past the cars anyway. 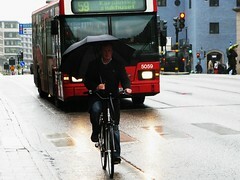 For me, when considering Smell in relation to urban cycling in Copenhagen, one thing pops instantly into my mind. Perfume. Not a single day passes without perfume wafting up my nose on the bike lanes, and I'm not exaggerating. 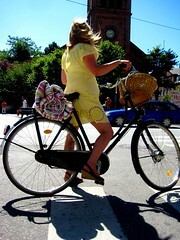 Cycling here is a fashionable affair [as if you haven't noticed that already] and perfume or cologne are second nature. Whether having a fellow Copenhagener overtake me or just following in the slipstream, perfume adds aromatic colour to the urban landscape. Even waiting at the red light downwind of another cyclist, the scent of their perfume, or even their shampoo, often drifts your way. Nice aromas but it also heightens that sense of being close to your fellow citizens. It's personal, somehow, even if you're strangers. I can't honestly remember any negative smell experiences involving sweat or body odour. Certainly during the summer, the scent of suntan lotion is everywhere in the afternoons when people are heading home from the beaches. Like in the post about Taste, I'm quite convinced that I can smell the seasons. The most strikingly aromatic season has to be autumn. The sweet organic smell of fallen leaves, intensified after the rain. The cooler air somehow sharpening the scent. Surely we can taste sunlight? Whether in high-summer, mid-winter or in the early days of spring? We can certainly smell the woods and the fields when we take shortcuts to work, and the seasons possess each their own unique combination of odours. I'm quite sure we can agree that we can smell the rain. I have this thing about water. Wherever possible I like to ride past it. Riding over the bridges in Copenhagen you'll always see people glancing to their right at the harbour. I suppose it's an addendum to the post about Sight, but the harbour has changeable scents, too. The salt water smell is vague and suggestive in the winter and richer in texture in the summer. The above film is comprised of stills that I took over six months on my way to work. I can smell the sea water just looking at the film. A few years ago I rode in another direction out of town to work, past a lake outside the city limits. The scents were just as remarkable and rememberable - the latter word was not a word until just now - as on the harbour. In the post about Taste, coffee was mentioned, and that applies to Smell. Whether your own coffee on the bike or someone next to you. Not a bad aroma. What you do smell or like to smell on your ride? Great videos espacilly the first one. What is the nice music? In the summertime, freshly cut grass while riding through the suburbs. In early fall, freshly mown hay from farmers' fields. In winter, salty slush and that cold metallic taste from riding in below-freezing temps. In spring, all measure of flowering trees and plants. Portland is arranged in neighborhoods everywhere but in the very center of the city, and so much of my commute to and from work is through neighborhoods of houses, and in the autumn, I love to smell the smoke from people's fires coming from the chimneys, the smells of things cooking in their kitchens - of course the rain and the leaves and the trees all have particularly earthy smells in the autumn. Fog and mist have distinctive smells as well. The cold, crisp air of autumn and winter does heighten the smells, I think. Usually in Portland I don't get close enough to other cyclists to smell cologne or perfume (I ride much slower than 80% of the cyclists I ride with, and our infrastructure just doesn't keep cyclists together), but I do on occasion smell my own cologne as it wafts up. Urban cycling certainly does make you appreciate cars with low emissions :) (especially when, like in Portland, you're forced to ride in traffic behind them frequently). Have to agree with Katie the smell of freshly cut grass in the summertime is so nice. A big fan of when you catch a waft of perfume from female cyclist. Cycling down the main street in my suburb on the way to work you can smell the bacon from all the cafes - yummy! Ooh - in London I used to cycle past the place where Costa roasted their coffee beans. Mmmmm. Pete and MO, I forgot about food smells! I love riding through my neighborhood and imagining what everyone might be having for dinner. M.O. hit this one on the head describing smells in Portland. The smell of the leaves in fall is my personal favorite. I would be remiss to fail mention of the fact that I pass both a coffee roaster and a brewery on my commute (route depending)! ha! fresh cut grass and people's cooking! that was what I was going to add! The smell of peanuts being freshly roasted right there in the Planter's Peanut store. Of course that is a memory of youthful cycling adventures, as such things never happen anymore. Hermetically sealed plastic packages of peanuts roasted hundreds of miles away who knows how long ago are available at the "drug" stores I pass. For my convenience. It has recently come to my attention that there are those who will go out of their way to follow me around for a time if I happen to be smoking a pipe. Yes, when slow cycling such things are possible. Help me, Mr. Wizard! It is time for this one to go home. In the meantime there is still the smell of a recently passed thunder storm; and coffee. I smell both great things and gross things. I pass a candy store, which makes it´s own caramel, so every morning it smells like melted sugar, but closer to the trainstation is a chickenfarm, and it stinks of chicken poop and dead chickens, but fortunately that´s only for a few seconds as I pass the farm. In autumn, it always smells of wet, decaying leaves (not a bad smell by the way) and in summer I can smell the grass and the corn (corn smells great, very sweet and fresh). Many of the smells already described are part of my experience. I ride in a residential area in St. Louis and I often get the smell of fabric softener from homes I pass. While not a natural smell, it is rather pleasant. I can echo many of the aforementioned scent sensations. One of my favorite experiences is reflected in Melancolic Optimist's statement, "cold, crisp air of autumn and winter does heighten the smells." Indeed. Another favorite is a slightly different take on the aromatic signs of seasons: I love catching scents of different plants as they come into bloom. 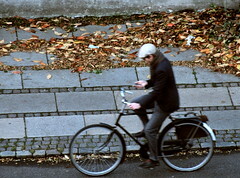 It's easier to do while walking places, but by far a more accessible experience while slow-bicycling versus car-riding. Blooming scents are not so available in some cities, but I'll take 'em when I can get 'em. Wonderful to read all these comments. My favorite smell is that of the chocolate mixture wafting from what must be Chicago's last inner-city chocolate making factory, Blommer's. Well, I think small, local, city producers of any such food products (like those peanuts!) are so rare nowadays in the States. I come within about 1/2 a mile of Blommer's on my ride home and if the wind is in my favor, the sweet smell of chocolate comes my way. It always makes me want to forgo dinner for chocolate! Another one I just thought of recently is jasmine bushes. I pass one outside someone's house on my way home from work in the afternoon, and right now the smell is almost tangible it's so strong. 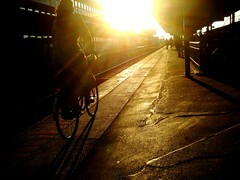 One of my secret favorite parts of being a bike commuter is smelling not just the good smells, but the BAD ones! So much of the time (in America and probably Europe, too), we're hermetically sealed in vehicles, homes, offices, etc. Nothing has much of a smell to it, really, except the chemical smells of air fresheners and grooming products. But riding a bike is like a buffet of very real smells. Fresh cut grass and bakeries, sure, but also the fish shop, the horses in the park, the East River... I wouldn't give the ranky smells up for anything! When I finally made the move from public transport to cycling last year, the first thing I noticed was the wonderful smell of Madeira cake baking in a local factory on my way home.